This month sees two of the blogosphere’s most celebrated events, Is My Blog Burning? and Sugar High Fridays, combined into one diet-busting extravaganza: a Holiday Cookie Swap! I must have been feeling guilty about my recent lack of participation in blogging events, or else I was bitten badly by the cookie bug, because it seems I went a little overboard. I woke up Saturday morning and immersed myself in a marathon session of sugar, butter, eggs and nuts, only to emerge Sunday evening with not one, not two, not even three, but four types of cookies to show for it. Luckily the results were more than worth the effort – they’re all unbelievably delicious, and hopefully they’ll provide the inspiration for some new and exotic treats to add to your holiday cookie table. Thanks to both Alberto and Jennifer and happy baking! These naturally-wheat free cookies come from Iran and the beautiful (and highly recommended) book on Persian culture and cuisine called New Food of Life by Najmieh Batmanglij. They’re intoxicatingly scented with one of my favorite flavor combinations, cardamom and rose water, and crumbly and rich from the addition of clarified butter. I was tempted to rename them ‘Persian Wedding Cakes’ – alluding to their similarity with a certain crumbly dome-shaped cookie from Mexico – but I decided these are good enough to merit their own linguistic identity. I did have a problem with the recipe as written, I must say. Using the specified amount of rice flour left me after mixing not with a shiny, moldable dough, but rather with a sticky, viscous paste. It took the addition of nearly twice the amount of flour called for to achieve a consistency suitable for shaping. I was worried about the impact of all that extra flour on the cookies themselves, but I needn’t have worried – they were perfect: dense, tender and just sweet enough. This may vary based on the brand of rice flour you use, but don’t fret if you also find that you need to add much more flour than called for – the important thing is that the dough is firm enough. Clarify the butter by bringing it to a boil over very low heat. Simmer for 15 minutes, removing foam from the top as it rises. When the liquid looks clear and the milk solids have settled to the bottom, decant the liquid into another bowl (leave the solids behind). Prepare the syrup by combining the sugar and water in a pot. Bring to a boil and simmer for 2 minutes. Remove from the heat, add the rose water and lime juice, and set aside to cool. It should be room temperature and not too thick before proceeding. Beat the egg yolks into the cooled syrup until incorporated. In a large bowl, combine the cooled butter, cardamom and rice flour. Mix well, then add the syrup mixture and mix until the dough is quite stiff and is no longer sticky [my note: it should be thick enough to hold its shape; if it’s not, add more rice flour in 1/4 cup increments until it is firm and shiny, with a texture like PlayDoh®]. Preheat the oven to 350F/180C. Line a cookie sheet with baking paper. Take a spoonful of dough the size of a walnut, roll into a ball between your palms, flatten slightly, and place on the cookie sheet. Repeat, leaving about an inch between cookies. Place the cookies in the preheated oven and bake for about 15 minutes, or until firm and cracked on top. They should still be quite white. Remove from the oven and allow to cool before removing from the paper, and be careful – these cookies crumble very easily. One word describes these cookies: amazing. After my recent love-affair with olive jam, when I spotted the recipe for these cookies I knew I had to make them. They’re unlike any other cookie I’ve had before, combining the texture of a tender shortbread with the floral grassiness of olive oil and the salty bite of cured black olives. There’s a bit of hesitation at the first bite, but after that, you simply can’t stop eating them. The recipe for these comes from the talented Susan Herrmann Loomis, resident expert on French cuisine and author of several books including On Rue Tatin. This particularly recipe, she explains, "comes courtesy of Jean-Pierre Autrand, whose family produced olive oil at Les Vieux Moulins in Nyons, an ancient olive mill, until 1952. Mr. Autrand found this recipe in his family’s archives, updated it, and sells the results at the gift store adjacent to the olive mill." You can find Mr. Autrand at Les Vieux Moulins, 4, Promenade de la Digue, 26110 Nyons, France. 011.33.(0)4. 75. 26.11.00. Preheat oven to 350F/180C. Line two baking sheets with parchment paper. In a large bowl or the bowl of an electric mixer, cream the butter until it is soft and pale yellow. Mix in the sugar until blended, then drizzle in the olive oil and mix until combined. Add the flour and the sea salt, and mix gently but thoroughly until the dough is smooth, then add the olives and mix until they are thoroughly incorporated into the dough. minutes. Remove from oven and cool on wire racks. *Instead of rolling and cutting, I actually found it easier to press all the dough into a shallow pan by hand, shortbread-style, score rectangles, and cut them immediately after baking. I’ll start off by telling you that this recipe probably doesn’t come directly from Poland. While there is a type of pastry there called a Mazurek, which I believe is eaten at Easter and contains a rich dough topped with fresh and dried fruits and nuts, this particular cookie seems to be a Seattle delicacy. When I was in college I spent a summer working at a small coffee shop on Bainbridge Island, across the sound from Seattle, and by far the most popular pastry we sold was a small bar cookie with raspberry jam called a ‘mazurka’. I never found out who supplied these ambrosial cookies, but I have since seen references to several Seattle bakeries making and selling them, and I have to assume it’s a local adaptation of the Polish pastry that has taken on a life of its own. I’m happy to stand corrected if anyone knows anything more about them or has another recipe to share, but for my attempt to recreate them I turned to the only recipe I could find on the internet and modified according to my memory and tastes. While not quite living up to what I remember, they are pretty close, and got the thumbs-up from Manuel as he proclaimed them his ‘favorite of the weekend’. Don’t ask how many he ate. Preheat oven to 350°F. Line a large rectangular pan (13×9 inches or thereabouts) with foil and butter the foil. Combine all dry ingredients in a large bowl. Break up any clumps of sugar with your finger tips and work the ingredients to mix them. Add the melted butter and work with fingers to combine well. Press half of dough in the foil-lined pan, working well into edges and pressing down to compact. Spread out the jam evenly to within 1/2 inch of edges of pan. 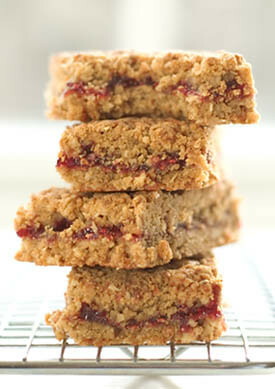 Take handfuls of remaining dough mixture and crumble it over pan, distributing evenly. Press down with palms of hand to compact – but not too hard. Bake until golden-brown, about 45 minutes. Cool completely before cutting. Cut lengthwise into 3 even rows and crosswise into 4. These chewy little almond gems are similar to the more famous Amaretti Morbidi (soft Amaretti), but are a specialty of the Tuscan town of Siena. When Manuel and I were last in Siena a few years ago, I spent the better part of a day searching for these elusive cookies and buying as many variations as I could. I had hoped to have some to take home as gifts and edible souvenirs, but they were so good we had finished them all by the end of the day! Snow-white outside and meltingly soft inside, they’re a fragrant, cloudlike version of the best marzipan you’ve ever eaten. This recipe comes from Tessa Kiros and her enchanting book on Tuscan food, Twelve. I loved Tessa’s version of these cookies for the orange peel she adds – it raises the almond ecstasy to new heights and gives the cookies an injection of citrusy freshness that cuts the sweetness a bit and provides the perfect counterpoint to a cup of strong black espresso. Line a baking sheet with baking or parchment paper. 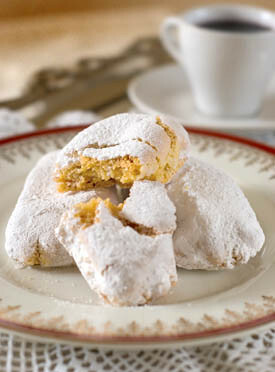 Mix the almonds with the sugar, two-thirds of the powdered sugar, the baking powder and the orange zest in a bowl. In a clean bowl, beat the egg whites to soft peaks, then stir them into the almond mixture. Using a large spoon, mash the mixture to a wet, sticky mass. Stir in the almond extract. Form oval or torpedo shapes about 2.5 inches long, roll in the remaining powdered sugar, and flatten slightly. Put them onto the parchment-lined baking sheet, allowing room to spread slightly, and sift the remaining powdered sugar over the tops. Leave the cookies at room temperature for about 2-3 hours to dry a little before baking. Preheat the oven to 275F/140C. Bake the cookies for about 30 minutes, or until they are lightly golden and a little firm on the outside (the insides should still be soft). Cool completely and store in an airtight container. Four cookies! Amazing. The photos look luscious. I’m especially intrigued by the scourtins, can’t wait to try those sometime. Your cookies are absolutely beautiful. I’d love to make the rice cookies for some of my wheat-free friends. Thanks for the recipes! Melissa, you’ve outdone yourself, my dear. First, four different cookies, and then four scrumptious photos! I have a terrible weakness for anything with a good almond flavor, so the richiarelli are first on my to-do list. Thank you! Melissa, you continue to astound! gorgeous cookies and stunning pictures. The scourtines have me very intrigued. When I get my new oven they will be one of the first things I make. I cant wait! ojojoj, those almond cookies look beautiful. if they taste half as good as they look thats plentiful. they will be perfect for xmas, wont they?ps! c u in edinburgh on saturday?! Love your site! Your photos make me jealous but also motivate me to get more creative! I’ve linked to you on my food blog and will be back often! All four cookies look amazing – am especially tempted to try the olive cookies and almond cookies. And Persian rice cookies. And those mazurkas look yummy as well.. You’ve given me quite a few ideas for baking moments again, Melissa!PS. Will email you the cranachan recipe later this week! What can I say my dear that has not already been said? Your styling and execution are nothing short of perfection. What an inspired collection of recipes! Hi Melissa,Thanks for taking us around the world with cookies! I have never heard of most of these, so I’m glad to be getting the introduction now (especially since it’s coming from you!) Brilliant photos and excellent write up, as usual. wow! So many good ideas all at once! But I was most amazed by the olive-cookies and attempted them at once. Could you maybe tell me what 9 Tbs butter would be in grams? Or even ounces would be ok, I can convert from there, but 9 Tbs butter is such a guess for me! I started with real tablespoon-fulls, but the dough was at the end very crumbly, didn’t hold at all and was far from your your description "sticky". So I kept on adding melted butter AND olive oil (in the end it must have been something like 175g butter and 1/4 cup of olive oil) till I had something which held. I baked it like you did, all in one big pan and cut into squares while still warm. Though a little bit crumbly, they were so delicious that an olive-hater friend who had them last night along with wine took some with him to take to office today! Everyone loved them last night. Thank you! Oh my lord, those Persian cookies are so, so gorgeous. I could taste them just by looking at them. Thanks for the recipes. I’m totally awestruck. These look beautiful, as does your entire blog. I’m surprised that I only just stumbled upon it. Lovely. Melissa: You’ve been lavished with praise already, but you deserve more! This dazzling array of cookies takes my breath away. Clearly, I’m going to make the rice cookies and almond cookies almost immediately! And recommend them to my readers this week. 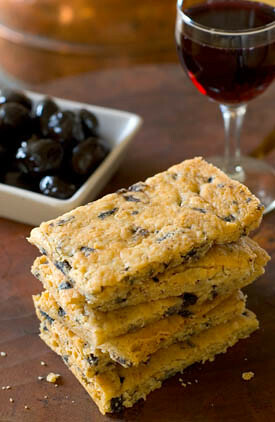 Do you think the olive cookies would work with gluten-free flour? Beautiful photos. I can’t decide which is my favorite – I want to try them all! All four of your gorgeous entries are going on my Christmas cookie list to make in the coming weeks! But I am especially intrigued by the Scourtins as I adore olives! Yum, yum, yum! Love your site – both your pictures and writing are excellent! The link to my post about your Ricciarelli is at http://www.kit-is.com/kitchen .The blog is in a temporary design shift, so I apologize that it’s not looking its best right now. Hi Melissa,I made the Persian Rice Cookies. They look and taste exquisite !I’m posting about them tonight on my blog and will give the link to your recipe. I have special plans for those sophisticated cookies… :-))Next thing I try, as soon as I find decent black olives, are the scourtins. I suspect they’ll make perfect week-days snacks for home, the office or school.I wish you a very happy new year! Hi Joy, thanks for stopping by! I’ll really have to start rewarding my dear dad for doing all this PR work for me 😉 I hope you enjoy the scourtins! Melissa, I am new to your site and every time I come here it takes my breath away. The beauty of the pictures, the lovely texts, the beautiful site..How wonderful. Melissa,Who takes these amazing photographs? Would the person be interested in a commision to shoot the photos for a cookbook in the making. The fee is a return flight to India and hospitality for a month.Keep in mind Indian food is not too photogenic. Melissa-If you have not already gone flying off to India (! 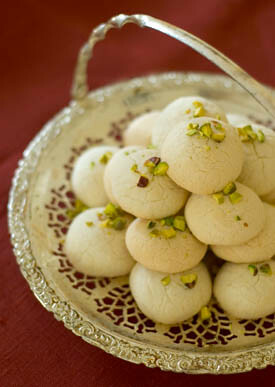 ), I have had a thought about the Persian cookies, which did not turn out too well when I made them. As you predicted, I had to add quite a bit of extra rice flour to get the dough to cohere, and I think I was too heavy-handed, because the texture of the cookies was very grainy and not nice (not sandy in a nice way, like shortbread, but sandy like ,well,sand. )It occurs to me that with the amount of butter in these cookies, they are almost pastry-like, and perhaps rather than adding more flour, it might be an idea to chill the dough to make it easier to handle? I’m thinking about giving these another try, because the ingredients list (apart from the rice flour, which is new to me) is full favorite flavors. and they’re pretty too.I do agree that your photos are just lovely. In addition to the prettiness, they always make the food look real, and delicious. Hi Valentina – What wonderful compliments, thank you!Hi Deccanheffalump – The photographs are all mine. I can’t tell you how tempting your offer sounds! I’ve sent you an email.Thank you Lindy! I’ve been thinking about your cookie problem and must admit I’m a little stumped. Could it be that the texture of your rice flour is quite coarse? I’m just wondering how they could come out sandy – mine, despite packing in quite a lot of flour, were quite delicate. Another brand might give you different results. I’m curious about your chilling theory, though, so if you do give it a try, let me know how it works. I’m sorry they didn’t turn out, and I hope you’re able to get to the bottom of why not! I made the Scourtins – not only were they easy (and I have nearly zero experience in baking) but they were absolutely delicious. Perfect.Because it is impossible to improve on perfection I felt compelled to try. So I made another batch, and added a couple of tablespoons of strong, dark honey and chopped, fresh rosemary to the dough. I had this weird hunch about rosemary/honey/olives that I just had to try out.It was even more sticky and tricky to work with, but the results were better than perfect. It seemed to cook slightly quicker than the regular dough (I baked both side by side to compare) and it ended up slightly darker.And this is odd: I just tried that ingredient converter you posted above, and it converts 9 tbsp of butter to 84.6g. However, I used this site for my own conversions: http://www.cambridgeculinary.com/equivalents.aspx and calculated 9 tbsp to be about 125g. It lists 16 tbps as 1 cup, so I figured 9 would be approximately half a cup. Half a cup of butter according to that site is 125g. I actually used nearer 150g (since my butter came premarked in 50g divisions) and the scourtins seemed fine. I haven’t tried the Persian cookies again yet, but I did make the scourtins. They are absurdly fabulous. I have developed an addiction, and have not yet offered any to anyone else, because I do not wish to share my hoard. (I did clue my daughter in Cleveland in to the recipe, and hope that she will one day offer me some at her place. )I formed my cookies by making the whole thing into a long tube, and sliced thin oval cookies from it. Thank you for another recipe destined for the permanent repetoire. I used to work in the bakery in seattle that made mazurkas – it was called the Mcgraw st Bakery. They made raspberry, apricot and my personal favorite espresso. The bakery is no longer there and I’ve been trying to figure out how to recreate their taste. You can still find them around seattle but they’re not the same. Thank you for the inspiring post. I’m a sucker for cookies made with things you wouldn’t expect (spinach, e.g. ), so I’m looking forward to trying the scourtins. And the Persian rice cookies, and the mazurkas . . .
I’m going to be using rose water more often now, thanks! I made the olive cookies today. Wow, they are delicious! I normally don’t like shortbread or non-chocolate desserts, but I must have ate 10 scourtins today. I’m looking forward to making the scourtines tomorrow. I just made the persian rice cookies–they taste wonderful but boy, they ARE crumbly! As in, they crumble apart as I’m taking a bite out of them. I wonder if making them with the original amount of rice flour would have solved this issue. Anyway thanks for all your wonderful recipes and beautiful writing and photography. There are plenty of food blogs out there but yours is in my top two or three. Hey there! i wanted to let you know i made the polish raspberry mazurkas and they were incredible. it’s sort of late – i made them last year, lol. they were incredible! i’ve posted about it on my blog and linked back to you. Thanks so much for your generosity in sharing the recipe! I've come back to this post several times, the photographs are just beautiful and the recipes intriguing! I'm hoping to make the almond cookies for Christmas but was wondering how long they stay fresh for? Thank you!